GHRDC (Global Human Resource Development Centre) Survey 2019 are out and Chitkara University programs have once again been ranked among the Nation’s Best. 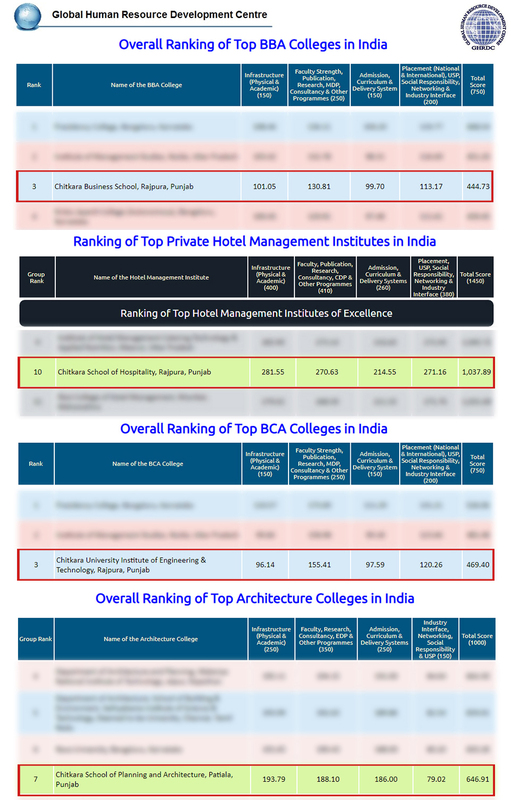 Chitkara Business School (CBS) has been Ranked 3rd in ‘Overall Ranking of Top BBA Colleges In India’ and Ranked 2nd in the ‘North’ Region in ‘Ranking of Top BBA Colleges by Region’; Chitkara School of Hospitality has been Ranked 10th among ‘Top Private Hotel Management Institutes in India’ and Ranked 2nd in Private Institutes in the ‘Punjab’ Region in ‘Ranking of Top Hotel Management Institutes (Government & Private) by State’; Chitkara University Institute of Engineering and Technology, has been Ranked 3rd in ‘Overall Ranking of Top BCA Colleges in India’; and Chitkara School of Planning & Architecture has been Ranked 7th in the category of ‘Super Excellence’ and Ranked 2nd in the ‘North’ Region in ‘Ranking of Top Architecture Colleges by Region’, in GHRDC (Global Human Resource Development Centre) Survey 2019. GHRDC being highly research-based organisation has been the pioneer in starting the concept and practice of rating and ranking B-Schools from the very inception of its organization and has since (1998) been involved in rating and ranking of B- Schools in India. This was followed by initiating the Survey and Ranking of Hotel Management Institutes in the year 2007 and Engineering College Survey since 2009. Chitkara Business School has been Ranked 3rd in ‘Overall Ranking of Top BBA Colleges In India’ by GHRDC (Global Human Resource Development Centre) Survey 2019. Ranking parameters and scores – Infrastructure 101.5/150; Faculty Strength, Publication, Research, MDP, Consultancy & Other Programmes 130.81/250; Admission Curriculum & Delivery System 99.70/150; Placement, USP, Social Responsibility, Networking & Industry Interface 113.17/200; Total Score 444.73/750. GHRDC has been a pioneer in starting the concept and practice of rating and ranking of B-Schools from the very inception of its organization and since 1998 has been involved in rating and ranking of B-Schools in India. Chitkara School of Hospitality (CSH) has been Ranked 10th among ‘Top Private Hotel Management Institutes in India’ by GHRDC (Global Human Resource Development Centre) Survey 2019. Ranking parameters and scores – Infrastructure 281.55/400; Faculty Strength, Publication, Research, MDP, Consultancy & Other Programmes 270.63/410; Admission Curriculum & Delivery System 214.55/260; Placement, USP, Social Responsibility, Networking & Industry Interface 271.16/380; Total Score 1037.89/1450. The Hotel Management Survey initiated by GHRDC in 2007 was the first of its kind and since then it has been appreciated and received with the overwhelming response from the stakeholders. Chitkara University Institute of Engineering and Technology (CUIET) was ranked 3rd in ‘Overall Ranking of Top BCA Colleges in India’ by GHRDC (Global Human Resource Development Centre) Survey 2019. Ranking parameters and scores – Infrastructure 96.14/150; Faculty Strength, Publication, Research, MDP, Consultancy & Other Programmes 155.41/250; Admission Curriculum & Delivery System 97.59/150; Placement, USP, Social Responsibility, Networking & Industry Interface 120.26/200; Total Score 469.40/750. Keeping the tradition of consistency in quality, reliability, and transparency, GHRDC had introduced Survey for Engineering colleges in India in 2009. Chitkara School of Planning & Architecture (CSPA) has been Ranked 7th in the category of ‘Super Excellence’ and Ranked 2nd in the ‘North’ Region in ‘Ranking of Top Architecture Colleges by Region’, in GHRDC (Global Human Resource Development Centre) Survey 2019. Ranking parameters and scores – Infrastructure 193.79/250; Faculty Strength, Publication, Research, MDP, Consultancy & Other Programmes 188.10/350; Admission Curriculum & Delivery System 186.00/250; Placement, USP, Social Responsibility, Networking & Industry Interface 79.02/150; Total Score 646.91/1000. The key strength and hallmark of GHRDC’s Survey are transparency, reliability, consistency, and validation of data.